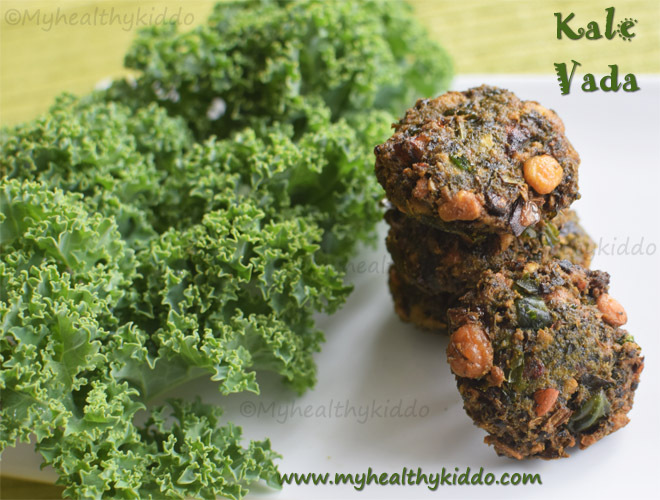 Kale fritters / kale vadai is a tasty & healthy snack made with lentils and kale leaves. 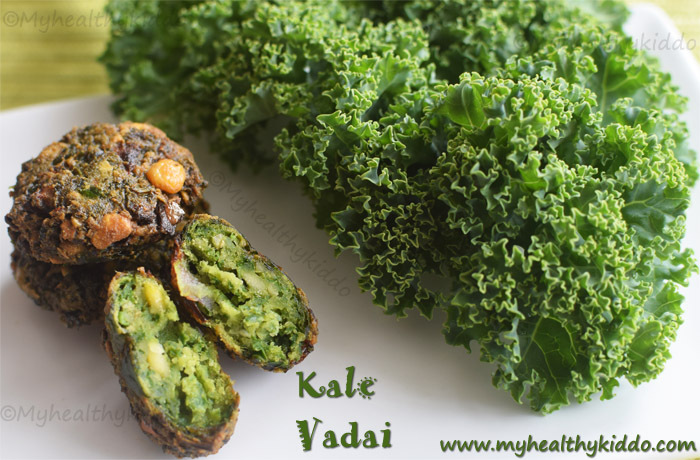 Kale vadai is the best way to include greens in fussy-eater’s diet. Kale is considered as the king of super-foods. Kale has a rich nutrition profile that has put it on the pedestal. Vitamin-C is required for proper absorption of iron in the body. Kale is rich in both, thus helps to keep anemia at bay. Beta-carotene rich kale is definitely good for eyesight. Cooking kale is said to increase the bio-availability of beta-carotene. Beta-carotene is fat-soluble and so it is advised to consume kale with some fat. So, deep fried kale vadai should be an ideal option 😉 Just kidding 🙂 Only a teaspoon of oil should serve the purpose.. 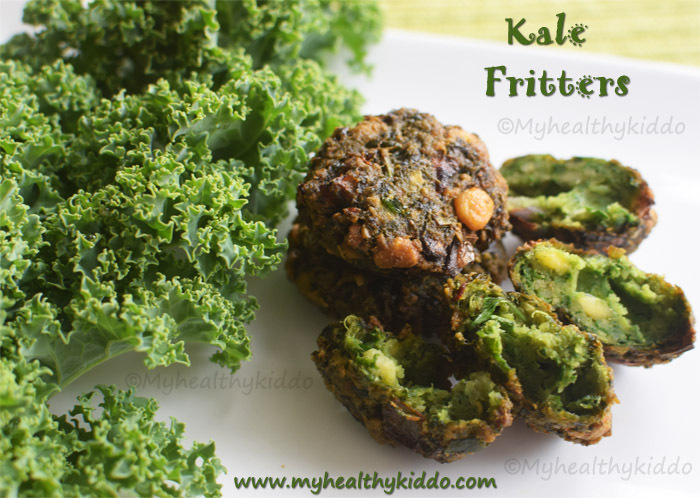 Still, who would say no to this yummy & crunchy kale fritters ?? Click here to see my keerai/greens recipes collections..
Take equal measurements of chana dal and toor dal. Wash it twice. Soak for 45 mins to 1 hr max. Soak the red chilli too. Chop 1 very small (or just half) onion, 5 curry leaves, 5 mint leaves, 5 stalks of coriander leaves finely. Peel and chop 2 garlic cloves and keep ready. When the dal is soaked, take out of water and drain in a colander or strainer. Grind soaked red chilli, ¼ tsp heaped aniseed/sombu, 2 garlic cloves, soaked and drained dal, ½ tsp kosher salt and ¼ tsp asafoetida/perungayam. Grind coarsely in batches(I ground in 2 batches). Wash 2 or 3 stalks of kale leaves and soak in water mixed with turmeric powder and lemon juice for 5 mins. After 5 mins, wash the leaves well, pour out the water and again wash it once or twice in normal water. Finally, drain the water and sprinkle away the excess water. Take each stalk and pluck the individual leaves seen at the base. From the top, use hand or knife to tear away the leaves from the stalk. Chop the leaves finely or just take handful of leaves(in batches) and give a single pulse in mixie jar. The leaves should appear as chopped and not ground. If you pulse more, it will affect the water content and color of vadai. If you are trying for the first time, pls chop the leaves manually. Take chopped leaves(kale,curry,mint,coriander), onion and ground dal in a plate or bowl and mix well with hand. Take a small portion and shape like a ball. Flatten them using fingers and drop them in hot oil(Once oil is hot, turn to low-medium flame). Flatten it slightly thick for soft inside or thinly flatten for full crispier ones. Shape and drop few fritters without crowding the pan. When one batch is getting cooked, parallelly shape vadais for next batch. Do not look for color changes if you use mixie to grind, as vadai will become slighly dark as greens are dense in the batter. Just when sizzling reduces(do not wait for sizzling to subside fully), drain excess oil and drop in tissue paper. 1.If you want golden vadai like normal masaal vadai, then use only 1 or 2 stalks or just 1 cup(loosely packed) chopped leaves. 2.If you are using tender baby kale leaves, then do not add in mixie jar. Just chop finely. 3.Garlic and red chilli combination can be replaced with green chilli and ginger. 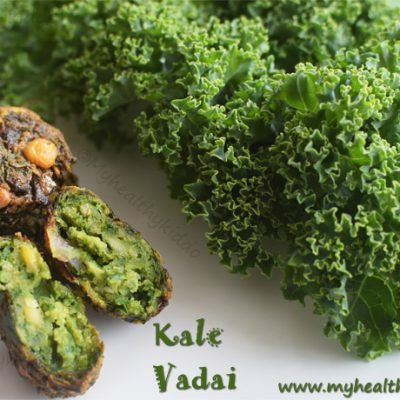 Preparation – How to make kale vadai? 1.Take equal measurements of chana dal and toor dal. Wash it twice. Soak for 45 mins to 1 hr max. Soak the red chilli too. 2.Chop 1 very small (or just half) onion, 5 curry leaves, 5 mint leaves, 5 stalks of coriander leaves finely. Peel and chop 2 garlic cloves and keep ready. When the dal is soaked, take out of water and drain in a colander or strainer. 3.Grind soaked red chilli, 1/4 tsp heaped aniseed/sombu, 2 garlic cloves, soaked and drained dal, 1/2 tsp kosher salt and 1/4 tsp asafoetida/perungayam. 4.Grind coarsely in batches(I ground in 2 batches). Wash 2 or 3 stalks of kale leaves and soak in water mixed with turmeric powder and lemon juice for 5 mins. 5.After 5 mins, wash the leaves well, pour out the water and again wash it once or twice in normal water. Finally, drain the water and sprinkle away the excess water. 6.Take each stalk and pluck the individual leaves seen at the base. From the top, use hand or knife to tear away the leaves from the stalk. 7.Chop the leaves finely or just take handful of leaves(in batches) and give a single pulse in mixie jar. The leaves should appear as chopped and not ground. If you pulse more, it will affect the water content and color of vadai. If you are trying for the first time, pls chop the leaves manually. 8.Take chopped leaves(kale,curry,mint,coriander), onion and ground dal in a plate or bowl and mix well with hand. Take a small portion and shape like a ball. 9.Flatten them using fingers and drop them in hot oil(Once oil is hot, turn to low-medium flame). Flatten it slightly thick for soft inside or thinly flatten for full crispier ones. Shape and drop few fritters without crowding the pan. When one batch is getting cooked, parallelly shape vadais for next batch. If you want golden vadai like normal masaal vadai, then use only 1 or 2 stalks or just 1 cup(loosely packed) chopped leaves. If you are using tender baby kale leaves, then do not add in mixie jar. Just chop finely. Garlic and red chilli combination can be replaced with green chilli and ginger.